(0 Customer Reviews) | Write Review 19 issues per year The highly collectable Fulham FC matchday programme App ensures you will never miss out on any Craven Cottage programmes - wherever you are in the world. You can purchase a year-long subscription which includes all Premier League and Cup games, or make a one-off purchase if you can’t make it to the game. If you take out an annual subscription all programmes will be archived in newsstand, giving you instant access to a whole season of Fulham action. 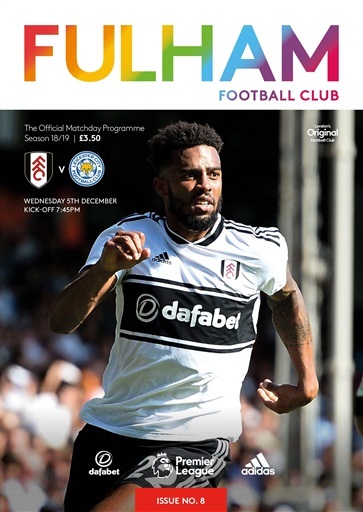 The highly collectable Fulham FC matchday programme App ensures you will never miss out on any Craven Cottage programmes - wherever you are in the world. You'll receive 19 issues during a 1 year Fulham FC magazine subscription. You'll receive 19 issues during a 1 year Fulham FC magazine print subscription.